- Press "Check %" to see what your progress is. - Press "New" to get a new Sudoku quiz. - Choose from the dropdown menu the difficulty. There are 5 choices: Kids, Easy, Easy +, Medium and Hard. 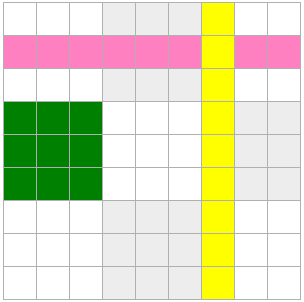 Each horizontal row (shown in pink) contains each digit exactly once. Each vertical column (shown in yellow) contains each digit exactly once. Each subgrid or region (shown in green) contains each digit exactly once.